Homeowners who snagged a low-interest rate mortgage in recent years have a big incentive to avoid refinancing the loan because interest rates are higher now. 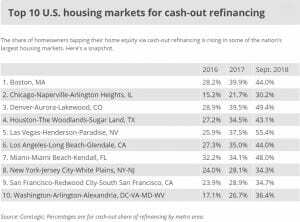 When they need a large amount of cash, though, some homeowners are turning to cash-out refinancing — even if it means giving up a lower rate in the process. In the past five years, the cash-out share of refinance transactions has jumped from 13.9 percent in 2013 to 41.5 percent by September 2018, according to data from CoreLogic. The trend follows the increase in home values and tappable equity, which is the amount homeowners with a mortgage can borrow before reaching the maximum 80 percent loan-to-value ratio. By the end of October 2018, homeowners with mortgages had access to $5.9 trillion in tappable home equity, down $140 billion in the third quarter from the previous quarter, according to data from Black Knight. To find out where the most Americans are using cash-out refinancing, we asked CoreLogic to look at data for the past decade. 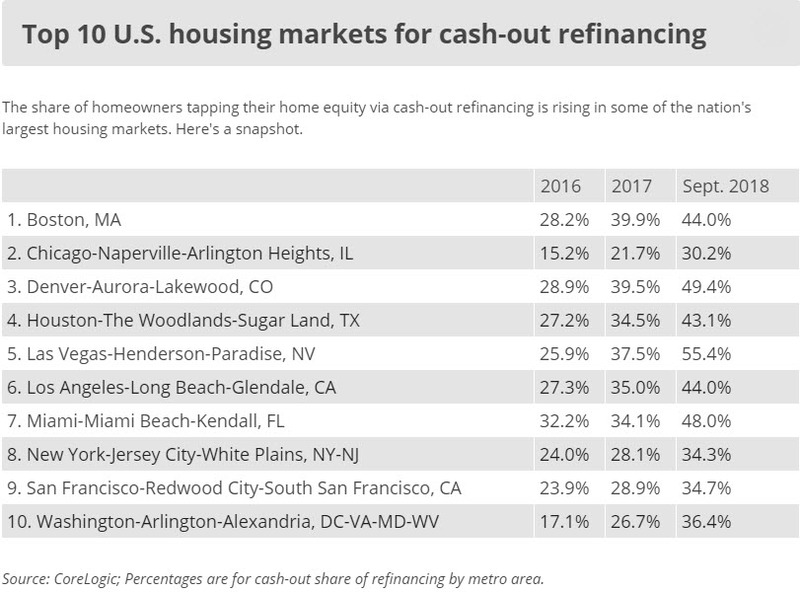 Here’s a snapshot of the top 10 housing markets where the cash-out share of refinancing has expanded most in recent years. Sacrificing a lower interest rate for a higher one to get cash is a price some homeowners are willing to pay to access their home’s equity — even if it means paying more interest in the long run. Mortgage broker Jovan Vaughn says clients in his Laguna Hills, California, market want to get the most out of their equity while they can to improve their financial footing. Cash-out refinancing for home improvements will see a modest boost in activity in the year ahead, especially with rising home prices and mortgage rates in the forecast, says Len Kiefer, deputy chief economist with Freddie Mac. Other factors, like paying down high-interest debt and economic uncertainty, could play a role in cash-out refinancing. Forecasts for slower economic growth this year, along with recent stock volatility, may further rattle consumers. “People are more worried about paying off things before a recession hits and they lose a job,” Vaughn says.